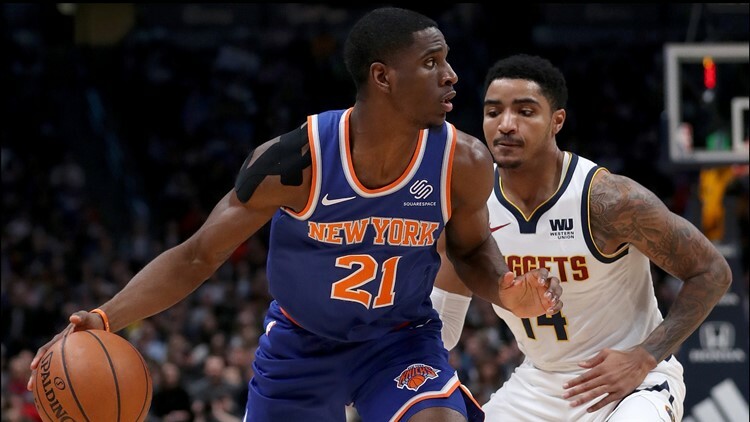 Damyean Dotson #21of the New York Knicks works his way to the basket against Gary Harris #14 of the Denver Nuggets in the second quarter at the Pepsi Center on January 01, 2019 in Denver, Colorado. Nikola Jokic had 19 points, 14 rebounds and 15 assists, including a late no-look pass to wrap things up, as the Denver Nuggets kept right on rolling by beating the New York Knicks 115-108 on Tuesday night for their ninth straight home victory. Reserve Malik Beasley added a career-high 23 points for the Western Conference-leading Nuggets, who have now knocked off the Knicks 11 straight times at the Pepsi Center. It was far from easy, though, with the Nuggets needing a big 3-pointer from Jokic with 2:55 remaining to finally gain some separation. The struggling Knicks have lost eight in a row. Luke Kornet led the Knicks with 19 points, while reserve Enes Kanter scored 17 points and grabbed 12 points. Kanter's recently voiced his displeasure about his role with the Knicks. It was the Jokic show with the 7-footer posting his third triple-double of the season. Jokic did a little bit of everything, including a heads-up play with 1:21 left and Denver leading 111-105. He grabbed a rebound and threw it off the back of Tim Hardaway Jr. as he was falling out of bounds. Later, Jokic delivered a no-look pass to Beasley to seal the win. The Nuggets are steadily getting back to health. They had Gary Harris back after he missed 11 games with a hip injury. Over the weekend, Paul Millsap returned to the court from a broken toe. Millsap had 16 points against the Knicks. Before the game, Nuggets coach Michael Malone voiced his concern over Denver's defensive intensity of late. The Nuggets tightened things up in the second half after falling behind by as many as 10 points in the second quarter. Knicks guard Emmanuel Mudiay scored 15 points against the team that selected him seventh overall in the 2015 draft. The Nuggets dealt him to the Knicks last February. Knicks: New York's last win in Denver was Nov. 8, 2006, when Carmelo Anthony suited up for the Nuggets. ... F Noah Vonleh grabbed 14 rebounds. ... F Kevin Knox scored 18. Nuggets: The only starter now missing is Will Barton, who's getting closer to a return after surgery to repair a hip/core muscle injury. ... G Torrey Craig scored 13. Although a popular basketball site lists Malone's birthday as Jan. 1, 1971, he insisted it was not his birthday. "Somebody else sent me a random text of happy birthday," Malone said. "It's a mystery. Don't believe everything you read." Asked when his birthday was, Malone joked: "You writing a book?" With several of his starters returning from injuries, Malone is trying to figure out a rotation pattern to keep everyone happy. It's going to be a work in progress. "None of them need to come back and be Mighty Mouse. We don't need anyone to save the day," Malone said. "Come back and do your part."